My first thought was that £650K was a pretty good price for a house even in London. So I looked up the numbers. Average House price in 1965 was between 3.2K and 3.5K (at the end of the year). The Average House price now is 209K (second quarter 2017). Average London price is £490,718 but the average London property is also a lot smaller than the rest of the country. 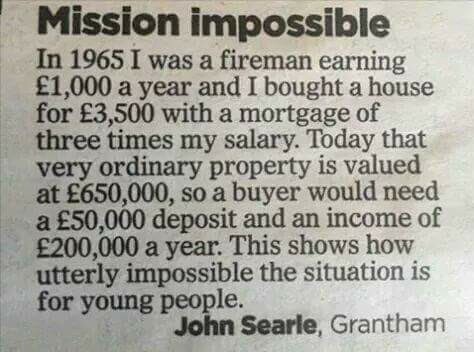 So could a firefighter afford to buy a house? Using that clipping lets assume the writer was on an average salary of £1000 and paid 1/2 a years wages as a deposit, around 14%. Today the average Firefighter wage is 33,018. Lets assume they have managed to save up 1/2 years wages over the years. That’s 16.5K. Lenders at the moment are willing to give 4x salary so that would be, 132,072. So they could afford approximately148.5K for a house, which comes in at around £920 a month which leaves plenty of room for bills and food. North East England, Yorkshire and the Humber, North West England, Northern Ireland, Scotland and Wales. For East and West Midlands this would be borderline so perhaps a below average house might be affordable. For East Anglia, South West, South East and London it would appear that Firefighters are totally priced out of the market. However there do appear to be some properties that would be affordable. For example a 2 bedroom cottage in Westbury for £149K or a 3 bed terrace in Norwich for £140K. I’m not a property or area expert so these might be horrible places to live. In London there does not seem to be much hope although there do seem to be some bargains to be had in the auction market (which are likely to need a lot or work) or there are a few house boats which would likely be a problem for the mortgage. So all in all, it’s not “Utterly impossible” and John’s a lucky man having bought at the right time.